This tasty meal is best served with pieces of toasted bread! Peel the carrots, cut into small pieces, place in pan with chopped parsley and crushed with 1 tablespoon butter. 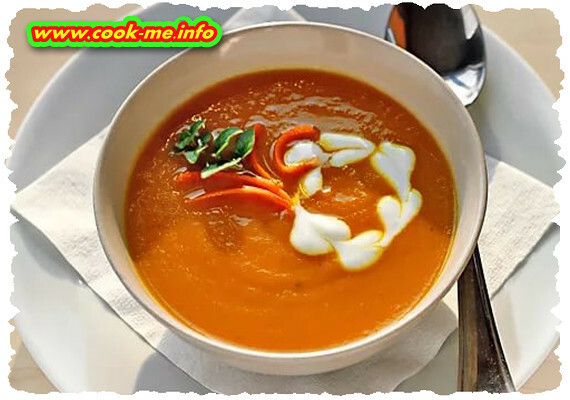 When the carrots have softened, turn them off with water, add salt and bring to a simmer for 15-20 minutes. Then strain the juice and carrot crush with a wooden spoon or sieve. Fry flour 2 tablespoons butter, hot milk thins, pour in mashed carrots, add the vegetable broth and simmer. Sprinkle chopped parsley. Tinker soup with 1 teaspoon sugar.